Three balls, all players sprint to follow their pass, from out of bounds 4 baseball passes to 1 who overhead passes to 2 who chest passes to 5 who bounce passes to 3 cutting to the basket. 6 will baseball pass when 4 gets in position. Try to make 20 layups in 60 seconds, switch sides. Progression - bounce pass for no-dribble power jump shots. 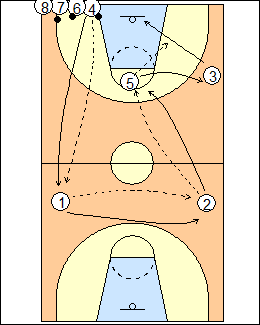 See Passing - Nash halfcourt, Nash 3-line meet the pass, Layups - Eastman pass and replace.